Distraction techniques are effective methods for the treatment of craniosynostoses when a significant gain of an intracranial volume is required. However, this technique raises some challenges at different stages of the treatment. While installing the distractors in patients with thin calvarial bone, there is a risk of dural damage from the titanium screws. The need for wide exposure of the devices and the screws during removal causes soft tissue damage and bleeding. This study aimed to evaluate sonic pin use in the distraction procedures. Resorbable sonic pins were used in 11 consecutive posterior cranial vault distraction procedures to attach distraction devices to the calvarial bone. This method allowed for a less traumatic and faster removal of the devices without the risk of leaving foreign bodies in the wound. In three out of 11 cases on follow-up, displacement of proximal distractor footplate and partial relapse of distraction were detected. Though there was a smaller volume increase in these patients, all of them benefited clinically from the PCVD and did not require reoperations. This method allows a strong and stable attachment of the distractor devices to the cranial vault bones with a reduced risk of dural tears due to the screws. It also allows for easier and less traumatic device removal. Posterior cranial vault distraction (PCVD) techniques are widely used as an effective method for the treatment of craniosynostoses where a significant gain in intracranial volume is required. After performing a posterior craniotomy, the osteotomized bone is attached with two to four distraction devices. The devices consist of two footplates with holes for screws, connected by one or two rotating bars. This allows the shifting of the footplates away from each other, thereby increasing the gap between the osteotomized bone and the rest of the skull during the device activation stage. It also allows for increasing the intracranial volume up to 30% . The footplates of the devices are normally attached to the bone with self-drilling titanium screws. After a latency period, the devices are normally activated at a speed of 0.5 to 1 mm/day. Once the desired distraction distance is achieved, the devices are left in place for a period of consolidation. During this period, the gap between the skull and mobilized bone flap is being ossified. It is assumed that if the devices were removed immediately, a relapse would occur, since the gap created between the bony edges during distraction would collapse. Thus, the distraction devices not only gradually shift the osteotomized bone but also provide a stable attachment for it until ossification occurs. During these activation and consolidation periods, the screws experience a certain amount of pressure. This first occurs while the bone is shifted against the soft tissue resistance, and later when keeping the bone in its final position. After the consolidation period, the devices are removed. Also, all the screws are removed to avoid foreign bodies being left under the skin. Titanium plates were earlier widely used in cranioplastic surgery. However, along with the introduction of resorbable materials, the titanium plates and screws have been replaced with resorbable ones in one-stage cranioplastic surgery. So far, there are no resorbable distraction devices on the market. The use of ultrasonic-assisted resorbable pins has been a further important improvement . In the authors’ experience, the replacement of conventional resorbable screws by sonic pins has shortened the operative time during the conventional cranioplasties. While the application of sonic pins to attach resorbable plates is a well-established method [6, 7], their usage in the placement of distractors has in previous research rarely been mentioned . Since October 2015, sonic pins have been used in the Burdenko Neurosurgery Institute as one of the methods of choice to attach the devices. This paper describes our experience using resorbable sonic pins for the attachment of the distractor devices during the posterior cranial vault distraction (PCVD) procedures. Eleven consecutively treated patients were operated on at the Burdenko Neurosurgery Institute, Moscow, Russian Federation, by performing the PCVD procedure using only resorbable sonic pins to attach distraction devices to the bone. The operations were performed between October 2015 and April 2016. The data on preoperative diagnosis, each patient’s age at the time of the operation, operative and distraction details, as well as complications, and results of follow-up were recorded in a prospective manner. All operations and follow-up evaluations were performed by the first author (LS). In total, the series included 11 patients: four girls and seven boys (Table 1). The mean age at the time of operation was 1.5 years (22.6 months), ranging from 6 to 66 months. The diagnoses were syndromic craniosynostoses in all cases (Apert 5, Crouzon 3, Pfeiffer 1, unspecified 2). In 10 cases, distraction was a primary procedure. Only in the case of patient number 11 was PCVD not a primary operation. He was first operated on at the age of 4 months through the conventional one-stage cranioplasty. The distraction procedure was performed on this patient at the age of 11 months due to further failure of the skull to grow. All operations were performed through a coronal skin incision. A posterior craniotomy was performed in a standard way, as described in a number of previous articles [4, 16, 17]. The distraction devices were positioned on the bone in accordance with the planned direction. For that purpose, holes were drilled into the bone through the holes in the distractor’s footplates (Fig. 1). This was done using a 2.1-mm-diameter drill. During drilling, a small raspator was placed between the bone and the underlying dura, to prevent dural damage caused by the tip of the drill. Next, sonic pins (Resorb-X, KLS Martin, Tuttlingen, Germany) with a diameter of 2.0 mm in seven cases, and 1.6 mm in four cases were installed using a Sonic Welding® device (Fig. 2). Twelve pins were used to attach a distractor, thus six pins were used for each footplate. The heads of the pins firmly attach the distractor’s footplates from the outside. Due to the contact of the melting pin with the underlying raspator, a similar “head” was formed on the tip of the pin on the inner surface of the bone. This technique converted the pin into a rivet and makes the structure even more stable (Fig. 1). Similar actions were performed in all remaining holes one by one. After the attachment was completed, its stability was manually verified. The following distraction devices were used: Cranial Vault Distractor 30 mm (KLS Martin), 10 cases; and in one case, a Cranial Vault Distractor 30 mm (Сonmet, Moscow, Russia). All devices used had hooks on the footplate in order to decrease the load of the screws in the footplate. In all 11 cases, two distraction devices were used in each patient. After a mean latency period of 5.2 days (range 3 to 8 days), the distraction devices were activated twice a day at a rate of 0.6 mm daily, thus 0.3 mm per distraction session for KLS Martin devices and 0.9 mm daily with 0.45 mm distance per session for Konmet devices. The patients were discharged from the hospital on the mean 7.3 postoperative days (range 6 to 10), after which, distraction was continued by parents at home. The duration of the period of distraction was 47.8 days (range 34 to 57 days). Due to geographical challenges (patients living far away from the institute), there were no planned follow-up visits during or at the end of the distraction stage. At the end of the distraction period, radiographic studies and photos of the child were taken, showing the head shape as well as skin condition. These images were sent to the authors for evaluation. Once sufficient ossification of the osteotomy was confirmed by the skull bone computer tomography (CT), the patients were invited to the Burdenko Neurosurgery Institute, and the distraction devices were removed. The consolidation period in these study patients was 108.6 days (range 20 to 170 days). 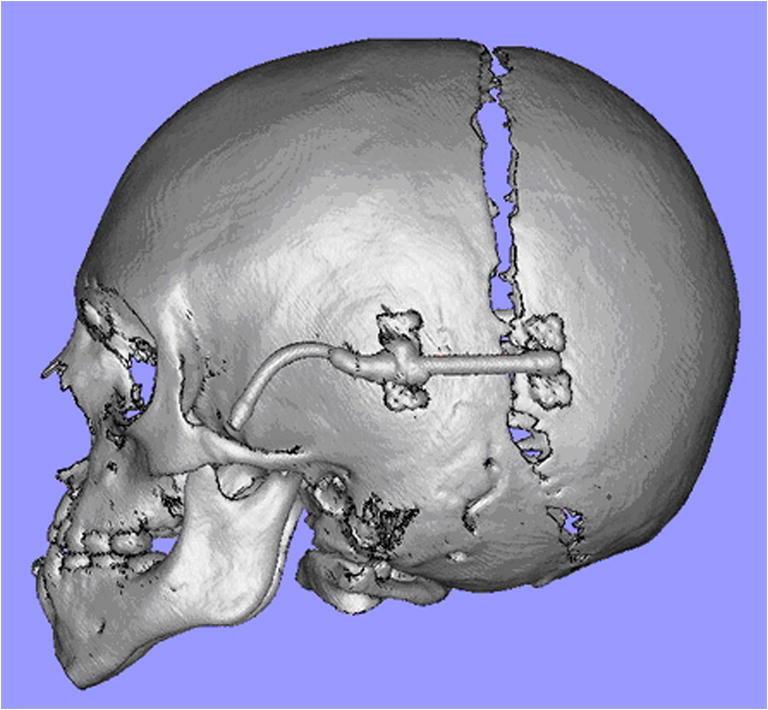 A skull bone 3D CT scan was performed on all patients prior to the PCVD and in 10 cases prior to the device removal (Fig. 3). During the removal procedure, a small incision was made in the region of the outlet of the distraction device’s activation arm. The distractors were dissected from the scar and subcutaneous tissue, and footplates were easily separated from the bone using a raspator. The devices were then removed through these small incisions. The distraction device removal took place 160.6 days (mean) after the primary operation (range 75 to 220 days). In one patient (case 4), due to the low quality of the follow-up CT scan, postoperative volume calculations were not available. The mean volume gain in the other 10 patients was 163.2 cm3 (range 53 to 290 cm3) which meant a 15.8% increase in the intracranial volume (range 3.6 to 34.0%). By the time of the removal of the device (on average 5.3 months after the primary operation), the pins had mostly been resorbed. The detachment of devices from the bone during the removal procedure was easier since there was no need to remove screws. That allowed for easy removal of the devices from small incisions. In all cases, the activation period passed uneventfully; there were no mechanical problems and neither was there compromise of ossification found in any cases. There were no cases of premature device detachment during the distraction period. Thus, in all cases, the distraction was conducted until a desirable opening of the devices was achieved (mean 28.7 mm, range 25 to 30 mm). On the CT scans conducted prior to the removal of the distractor devices in three cases (patients 5, 6, and 9, Table 1), displacement of proximal distractor footplates and partial relapse of distraction were detected (Fig. 4). The achieved volume increase in these patients was 53.0 to 96.7 cm3 (mean 81.5 cm3). In one case (patient 5), 1.6 mm pins were used, and in two cases (patients 6 and 9), 2.0 mm pins. Though in these patients the achieved volume increase was smaller than planned preoperatively, all benefited clinically from the PCVD and no reoperation was required. 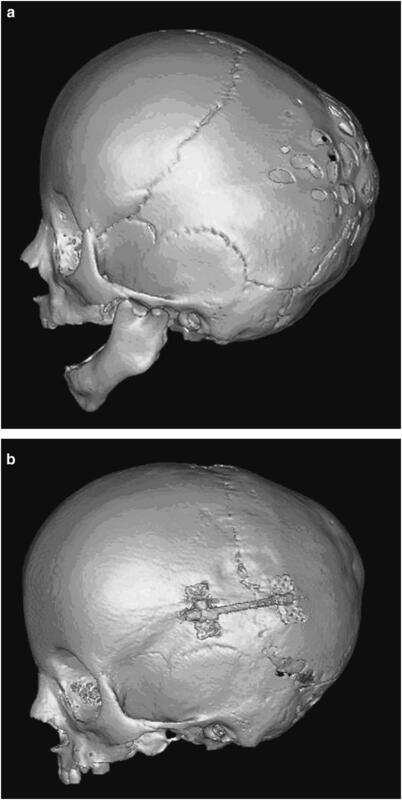 3D-CT reconstructions of patient number 9 with Crouzon syndrome: displacement of proximal distractor footplates and partial bone flap relapse, the achieved distraction distance was 11 mm, with an achieved volume increase of 96.7 cm3. In one patient (case 10), a gull-winging type  deformation of the bone flap at the site of the patent lambdoid sutures was detected on the control CT scan. In spite of a volume gain of 176.1 cm3, the patient had second posterior distraction performed without complications 6 months later due to the progression of craniostenosis. There were four cases showing mild infection and granulation in the area of the outlets of the external rods. However, there were no inflammatory complications in the area of the footplates with pins. In all patients, rapid and good healing of cutaneous wounds was seen after the removal of the distraction devices. PCVD is an effective method widely used in the treatment of various forms of craniofacial diseases associated with significant craniocerebral disproportion [4, 13, 14, 15, 16]. Despite many advantages to this method, the main drawback is the need for a secondary operation to remove devices. During the different stages of this procedure, there are certain challenges to be dealt with. When implanting the distraction device during the PCVD, especially in cases with a thin calvarial bone, there is a risk of damage to the dura from the titanium screws used to attach the footplate to the bone. Device removal procedure requires a wide exposure in order to remove the screws and device itself. This causes an additional trauma to the soft tissues. Also, separation of the footplates from the regenerating bone can be traumatic and cause bleeding. Removal of all titanium screws can be time-consuming. The problem of attaching devices to a soft thin bone can be solved by using a titanium wire as an addition to the screws . Placement of a resorbable plate under the thin bone prior to the device implantation can also be used . The main power load when using distractors lies on the hooks at the edge of the device footplates (when using the model with hooks) and on the screws if devices without hooks are used. Stable attachment of the devices is necessary to prevent the displacement of distractors from the bone surface. The probability of such displacement is greater if the distractors are not installed in a parallel direction, in which case, any of the attachment methods can be insufficient . Correct positioning of distractors minimizes the load over particular devices and thus decreases the risk of the detachment from the bone. Sonic pins appear to be sufficient and reliable enough to bear that load in the majority of cases. Outwardly stable attachment of the distractor devices was achieved in all cases during the surgery. However, one out of four cases with 1.6 mm sonic pins and two out of seven with 2.0 mm pins exhibited relapse during follow-up. Faster resorption of thinner pins or their insufficient mechanical strength is one possible reason for attachment failure during the ossification period. Though pins of 1.6 mm are normally used to attach resorbable plates during the conventional one-stage cranioplasties, it is recommended that pins with a diameter of 2.0 mm should be used for more reliable attachment of the distraction devices in PCVD. However, the size and shape of the holes in the footplate of the distraction device dictate the proper size of the pins. To prevent damage to the dura during drilling, a raspator pinched under the bone was used. This provides an additional benefit during pin insertion. Resistance to the tip of the pins below the surface of the bone during sonic pin insertion leads to the formation of a second “head” of the pin on the inner surface of the bone. This increased the attachment yield and avoids solidification of the pin tips into a sharp shape which can damage the dura. Of course, in patients with an extremely thinned “perforated skull,” none of the existing methods of device attachment will be sufficient. A thorough preoperative examination of patients and good planning is required (Fig. 3). However, even the presence of a coherent bone does not always guarantee reliable attachment with titanium screws. In the current series, in none of the cases were resorbable plates used under the bone. 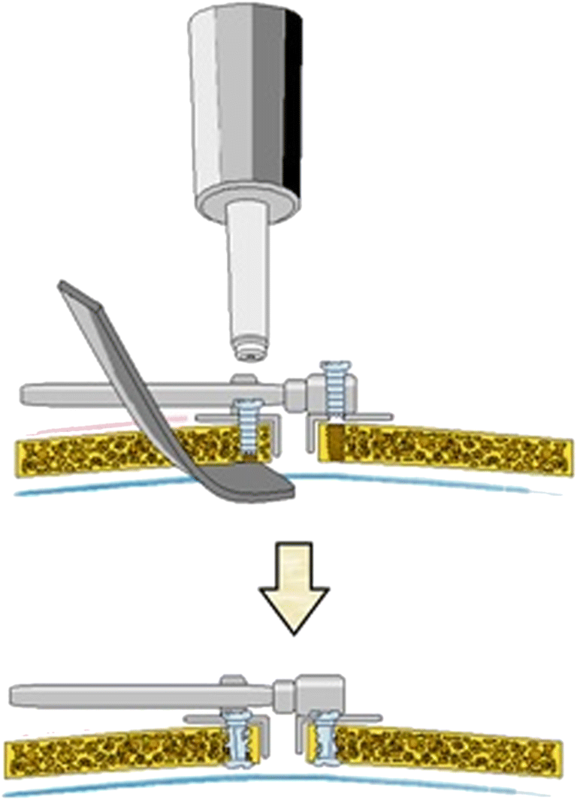 If attachment of the devices had been conducted in a conventional way with titanium screws, in some of these patients the authors would have preferred to use resorbable plates below the thin bone flap to strengthen it prior to device positioning in order to stabilize the attachment and to avoid dural damage caused by the sharp tips of the titanium screws. In the authors’ experience, resorbable pins are safer in cases of thin bone than titanium screws do. Sometimes, the removal of distractors can be more challenging than their implantation and requires a longer operating time, regardless of the length of the consolidation period. These can end up with screws and fragments of the distractors remaining attached to the patient’s cranium, which in its turn can lead to remote complications . CSF leak, caused by a device removal procedure and in turn complicated by cerebritis, has also been reported . Removal of the devices that were attached with pins appeared to be quick and easy. It is carried out through a small incision. With the help of a raspator, the device is easily mobilized from the bone and extracted from the wound. There is no fear that the residues of sonic pins will lead to subsequent complications, as can happen when using titanium screws. Remnants of pins will undergo resorption, as earlier described [1, 12]. During the entire distraction period, which in our series lasted from 34 to 57 days, the biodegradable material retains sufficient strength. If the consolidation period lasts over 2 months, the pins have already begun to resorb, thus, making it even easier to remove the devices. The first attempts to create distractor devices where metal parts are combined with biodegradable ones have already been achieved . The main aim of this was to facilitate the removal of the devices. However, these new partially resorbable devices are not as yet available in the market. Perhaps, the reason for this is the insufficient mechanical reliability of such devices, since it is known that biodegradable materials cannot be used in areas experiencing increased load. Another possible reason is the higher cost of biodegradable materials, which is one of the negative aspects of using sonic pins. When attaching distraction devices with biodegradable pins, the main load falls on the hooks of the legs of the devices. Or, in cases with devices without hooks, the load is distributed between multiple pins. In the authors’ experience, the stability of such a construct appears to be sufficient. Further study of the biomechanics of posterior distraction, as well as the mechanical properties of various distractors, can make the use of this technique even more effective. The authors’ suggested method involving the application of sonic pins allows for the reliable attachment of the footplates of the distractor devices to the cranial vault. Pins can be used for the attachment of distraction devices. 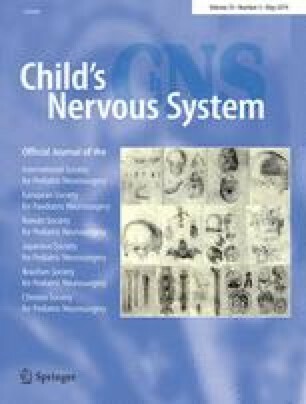 One particular indication for the use of this method is the thin cranial vault bone, which occurs in young patients, especially in the presence of intracranial hypertension. Application of sonic pins makes device removal simple. One should be aware of possible complications associated with the potential instability of distractors, which can be avoided by using pins with a diameter of 2.0 mm and correct installation of the devices in a strictly parallel manner.